In 1998, the Farrelly brothers scored the biggest hit of their careers with There’s Something About Mary, the film that put the gross into high-grossing American comedy. Three years later, the sibling auteurs further tested the limits of bodily fluid farce, and found out the hard way that even audiences who laughed uproariously at Cameron Diaz’s “spunky” hair day didn’t want to spend 90 minutes inside Bill Murray’s sweaty, overweight body. 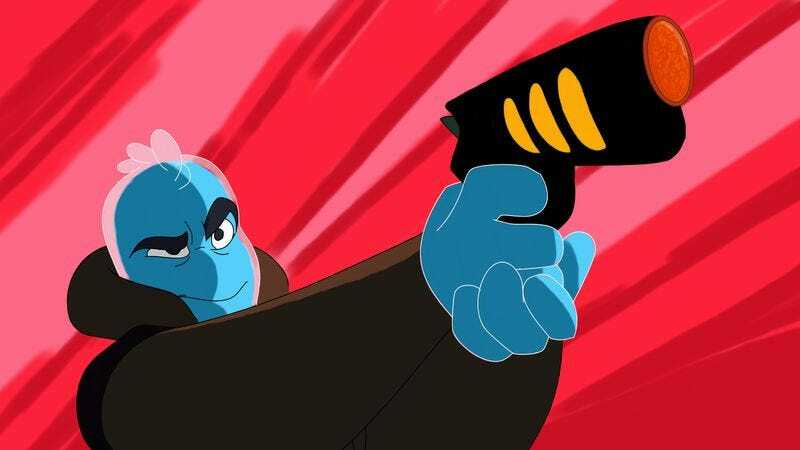 Osmosis Jones, about a slovenly zookeeper (Murray) and the police drama happening beneath his greasy skin, is the Farrelly brothers’ biggest flop. That’s a shame, as it’s also one of their most adventurous movies—an inspired blend of live-action and animation, and a funny, unusual spin on buddy-cop conventions. In truth, Peter and Bobby directed only the scenes with Murray, who spends the majority of his screen time behaving like a disgusting slob and ignoring the health tips of his concerned preteen daughter (Elena Franklin). The rest of the movie, set within Murray, was helmed by cartoon veterans Piet Kroon and Tom Sito, the latter of whom worked on Who Framed Roger Rabbit. Through sleek, colorful animation, the duo turns the squishy depths of the human body into a bustling metropolis, wherein arteries function like freeways, the stomach is an airport, etc. Here, a white blood cell who plays by his own rules (voice of Chris Rock) reluctantly teams with a by-the-book cold pill (voice of David Hyde Pierce) to hunt down the deadly virus running amok through Murray’s innards. The bug, played by Laurence Fishburne, is a villainous disease with a chip on his shoulder; he wants to do in 48 hours what Ebola needed at least another day to accomplish. Sound icky? Though there are plenty of less-than-appetizing moments—Murray accidentally popping a zit onto Molly Shannon’s face, for example—Osmosis Jones boasts more yuks than yucks, especially during its Innerspace-meets-Lethal Weapon passages. Part of the film’s appeal comes from Rock and Hyde Pierce, who commit completely to their familiar bickering-partners routine. The rest is the setting: Silly and nonsensical as it may sound, the “City of Frank” is a wondrous world to explore, and the filmmakers keep adding clever wrinkles to it, like a trip through the funhouse of Murray’s subconscious. (“This cat was sick before I got here,” cracks Fishburne on his way out.) Some network bigwig must have agreed: Despite its meager box-office returns, Osmosis Jones was later spun off into a Saturday-morning cartoon—an improbable second for the Farrelly brothers, after the blessedly short-lived Dumb And Dumber: The Series.